Let’s take a short break from gypsies with “Christmas in July”! 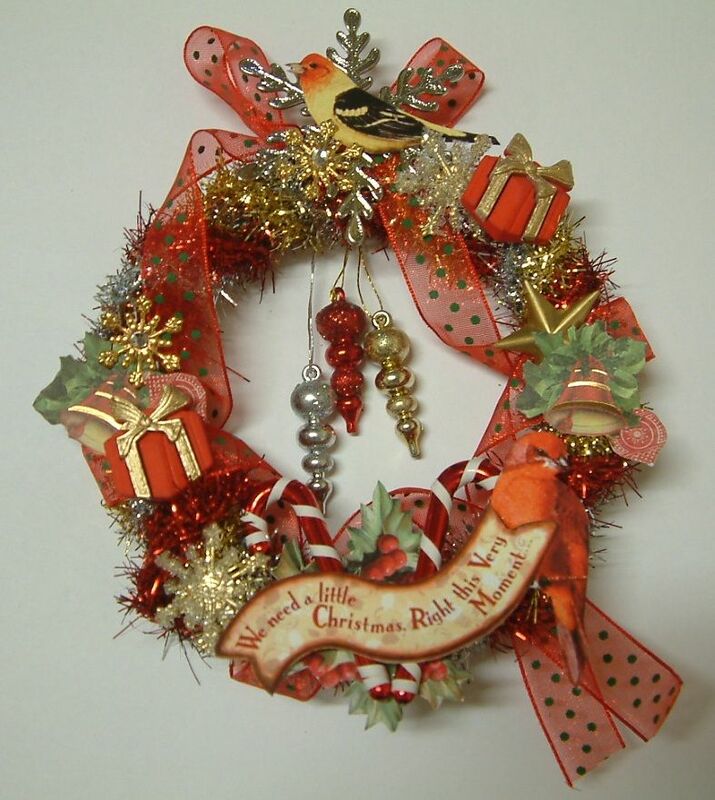 It’s never too soon to start thinking about your Christmas projects. Here’s a project that could be used as a festive piece of art to display during the season or as a gift for a loved one. 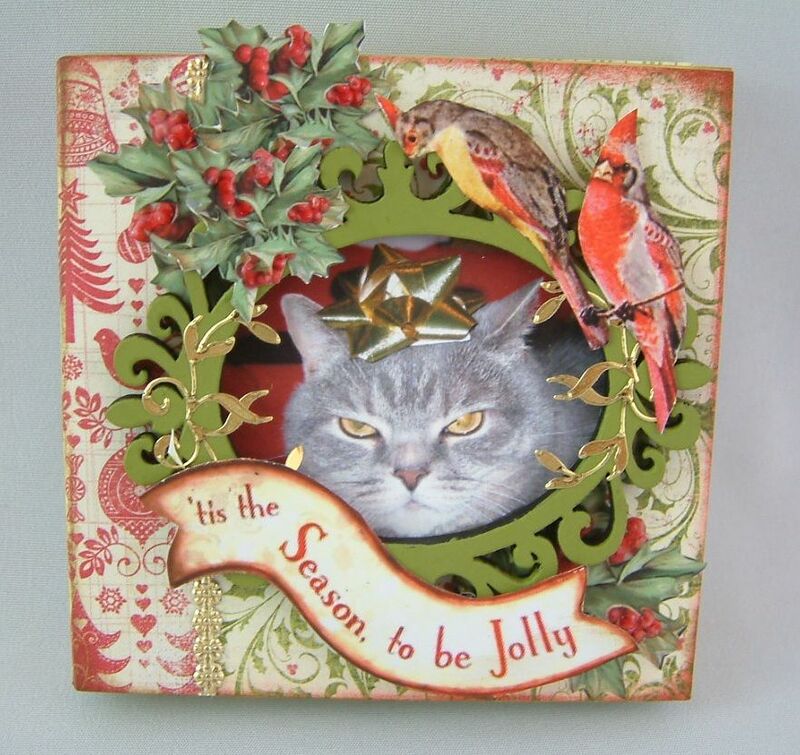 I’ve decorated the sample for Christmas, but it could be used for any theme. The Mini Album Bookshelf with books is made from an easy to assemble Masonite kit. 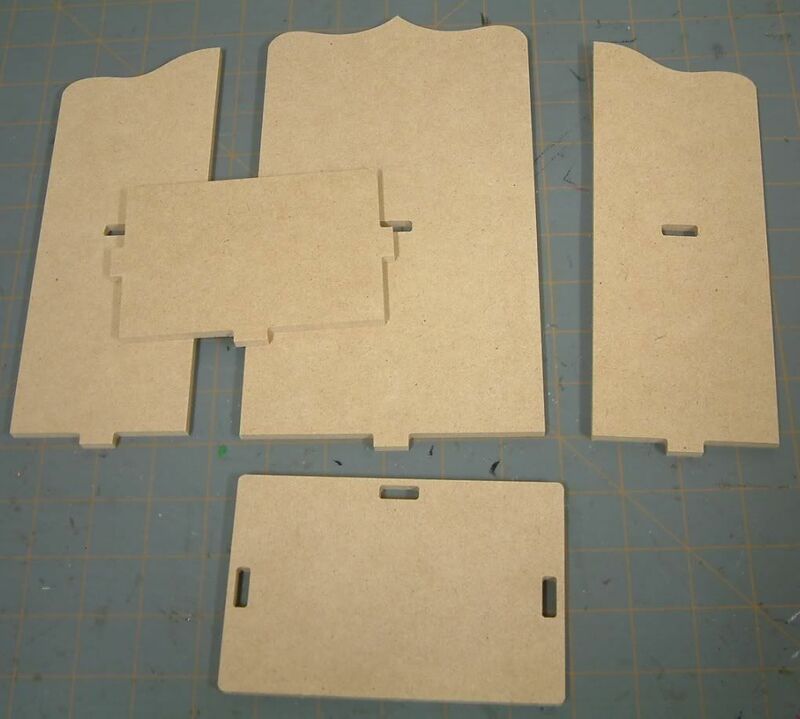 The assembled bookshelf is approximately 9 1/4 “ high (without the embellishments you see in the sample above). The bookshelf holds several mini albums depending on the thickness of each album. The albums are also made of Masonite and come in packages of 3 albums. Below are some tips on assembling and decorating the bookshelf and mini albums and a supply list. Before I started decorating the bookshelf I figured out how it was assembled. 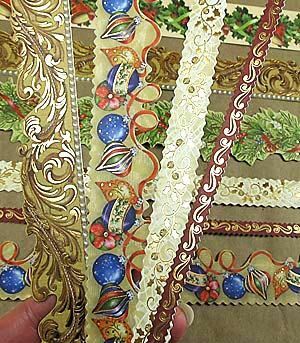 Familiarizing yourself with the assembly helps when deciding where you want different pattern paper to go and to make sure it’s on the side you want and going in the direction you want. You’ll also want to do as much decorating as you can before assembling the bookshelf, as it is much harder to decorate once the piece is assembled. I painted, added all of the paper and borders before assembly. I started by painting what will be the visible edges of the bookshelf red and the pages of the mini albums green. Next, I glued paper on all of the visible surfaces of the bookshelf. I used an X-acto knife and sandpaper to trim the paper from the edges. 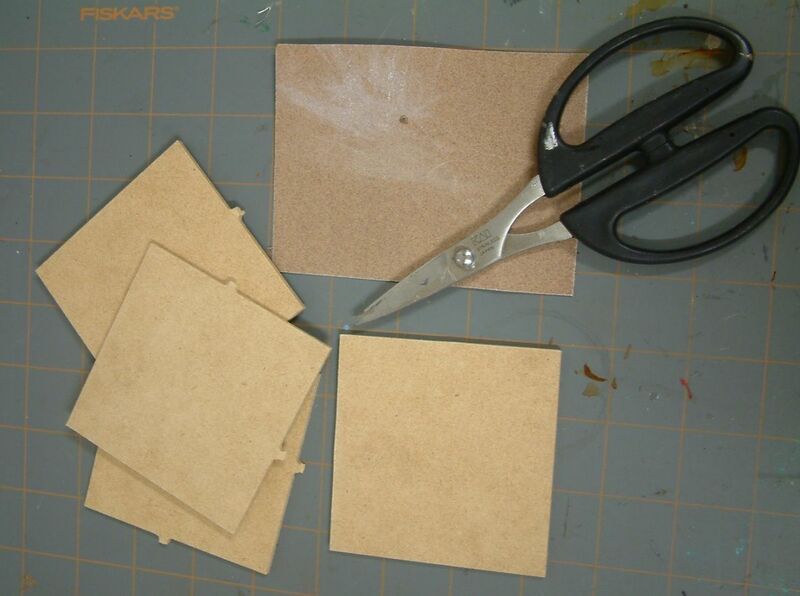 If you use paper to cover the surfaces you will need to reopen the holes used to assemble the bookshelf. Reopen the holes on the inside of the pieces not the outside so that the outside paper hides the construction. To give the piece a more vintage look and to cover the white edge of the paper I used Ranger Distress Ink (Brown Corduroy) on the edges of the paper. 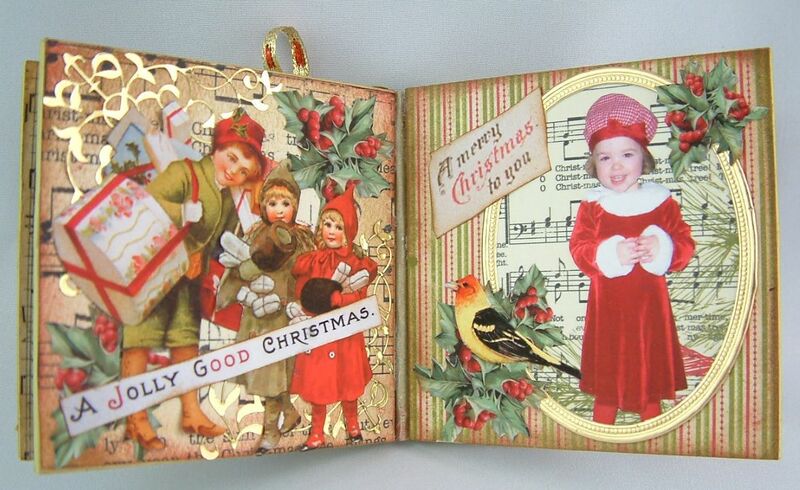 I added Visions of Christmas Foiled Die-Cut Cardstock Borders to the outside and inside of the pieces. I love these borders. 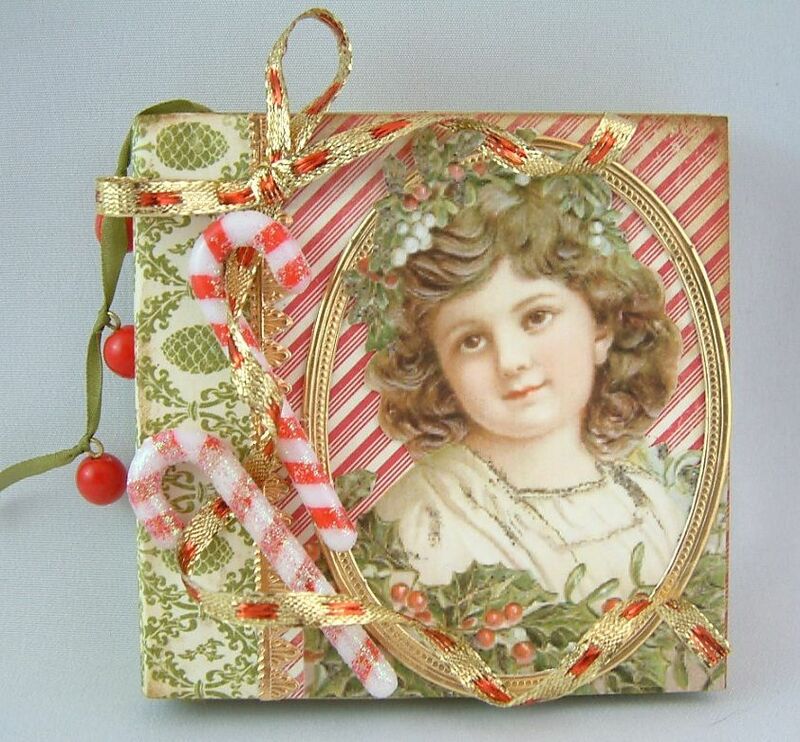 Some of the patterns can be used for non-Christmas projects. I glued the bookshelf pieces together. For feet I bent Brass Filigree Corners and attached them to the bookshelf using E-6000 glue. You need to use a strong glue to support the weight of the bookshelf. I also used tiny brass nails to add extra support to the feet. 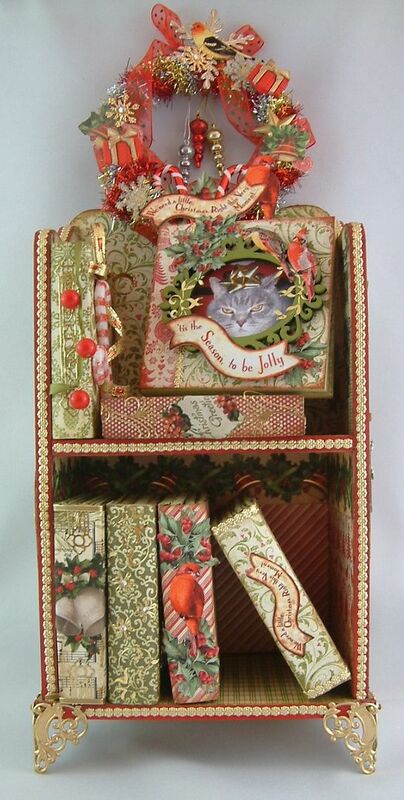 Next, I added collage sheet images and other decorative embellishments to the outside of the bookshelf and trimmed the edges with Dresden borders. To create the wreath at the top, I cut the center out of a plastic lid so just the edge remained. I then wrapped the edge with gold, red and silver tinsel. And of course added lots of embellishments. 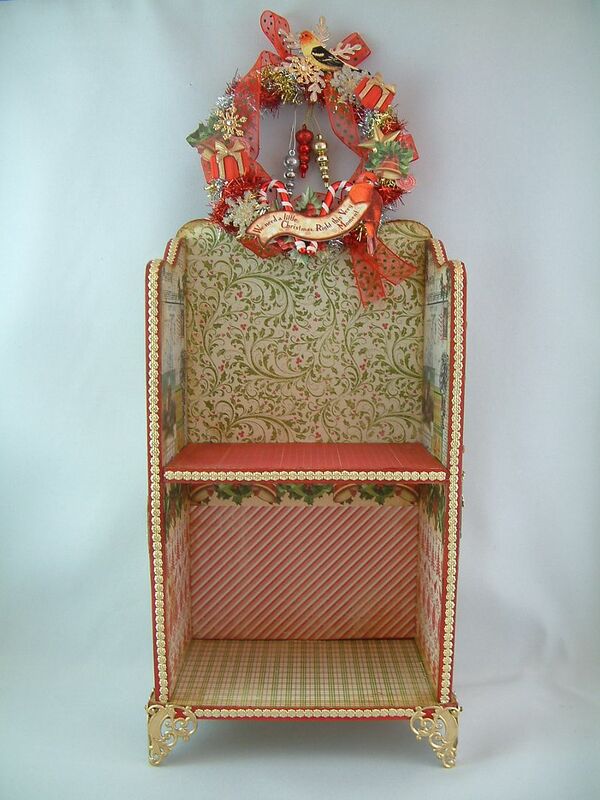 I glued the wreath to the bookshelf with E-6000 glue. The mini album pages come in a sheet. I broke the sheets apart, clipped the tabs off with a pair of sturdy scissors and then used sandpaper to file away the excess. There are different ways you can assemble the album pages. 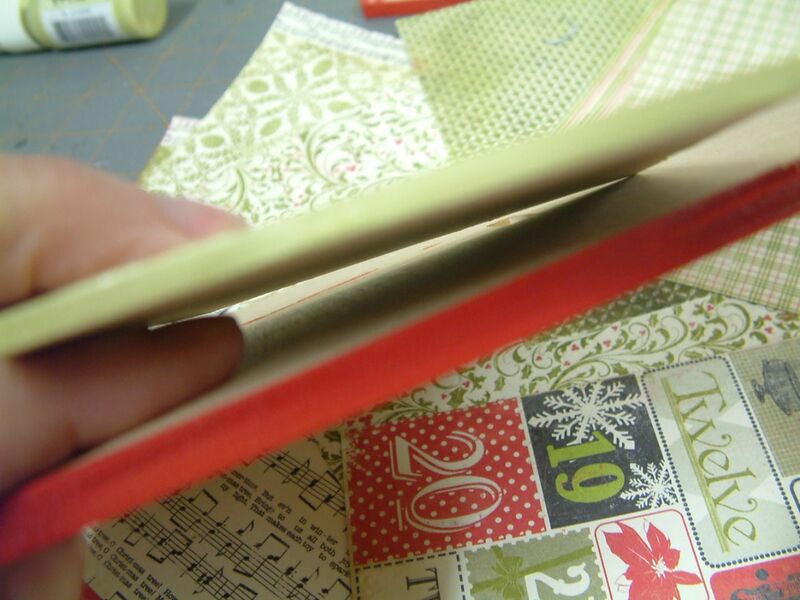 You could use paper to create an accordion fold album or you could glue the pages to a spine (which is what I did). If you are going to glue the pages to a spine you need to decorate the pages first and stick to flat embellishments (paint, paper, rub-ons stamping etc.). Whatever you add will create bulk. If you attach the spine before decorating the pages the book won’t close. I covered each page back and front with decorative paper. I inked and embellished the inside pages. I cut a piece of paper to act as the spine. I glued the front page to the spine paper. Next, I glued just the edge of the two inside pages to the spine. I used E-6000 glue as you need to have a strong bond between the Masonite pages and the paper spine so that when you open the book the pages won’t separate from the spine. Alternatively you could use fabric tape (bookbinding tape) as a spine. I glued the back page to the spine paper. Lastly, I decorated the covers of the albums and the spines. 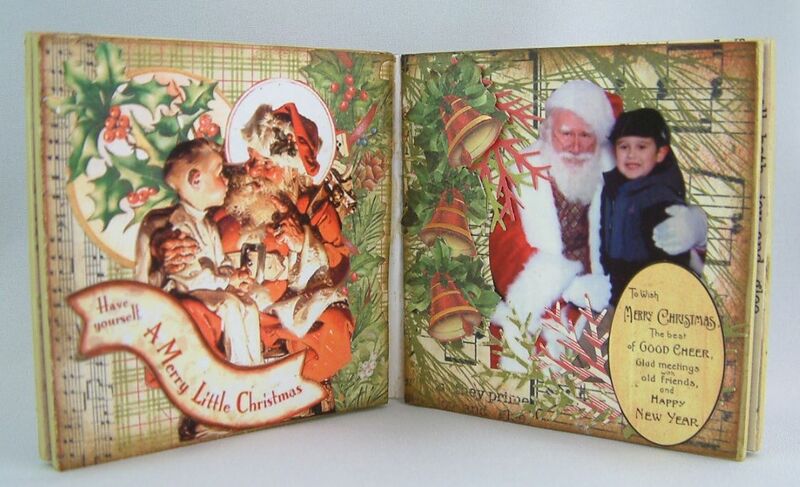 Alpha Stamps entire line of Christmas collage sheets are on sale plus all of the Christmas paper. This includes the collage sheets and papers I used in this project. 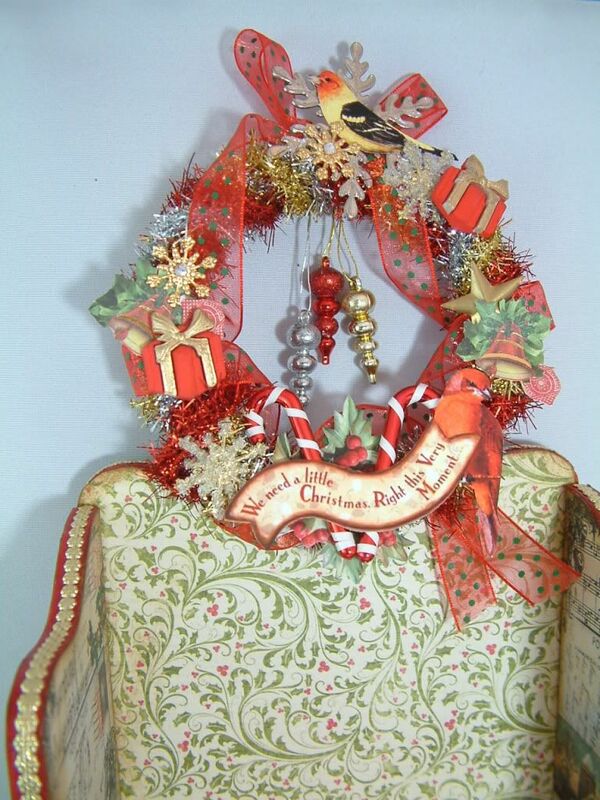 Some of the embellishments I used are also on sale. 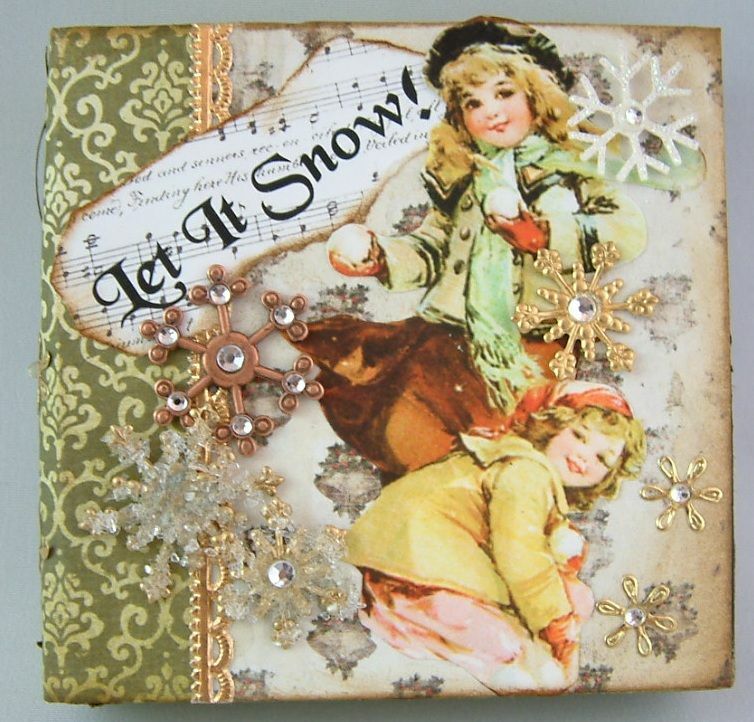 What a gorgeous keep-sake, love the papers you used and all the amazing embellishments.... thanks for the tutorial. What a STUNNINGLY gorgeous piece this is! !How helpful to have the instructions too.Thanks. This is all so special I don't know where to begin to comment on it. Thank you for telling us how you made it all--I so enjoy seeing your work. What can I say, you have outdone yourself again!!! Gorgeous. Alpha is so lucky to have you on their team. Oh my! The little bookshelf! what an adorable thing! How on earth did you manage to make me feel Christmassy in July, when it's 106 f outside? Now I want eggnog and gingerbread! 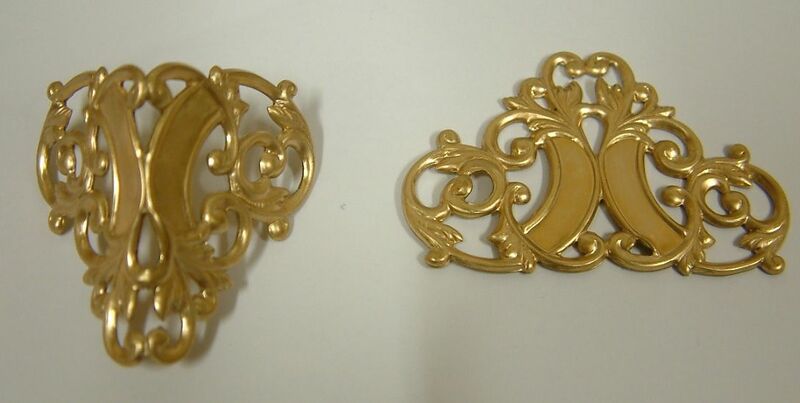 The brass corners I need to look at for Hubby's Steampunk Study. They look so delicate and 19th Century. STUNNING, AMAZING This is gorgeous. You amaze me with all your details. 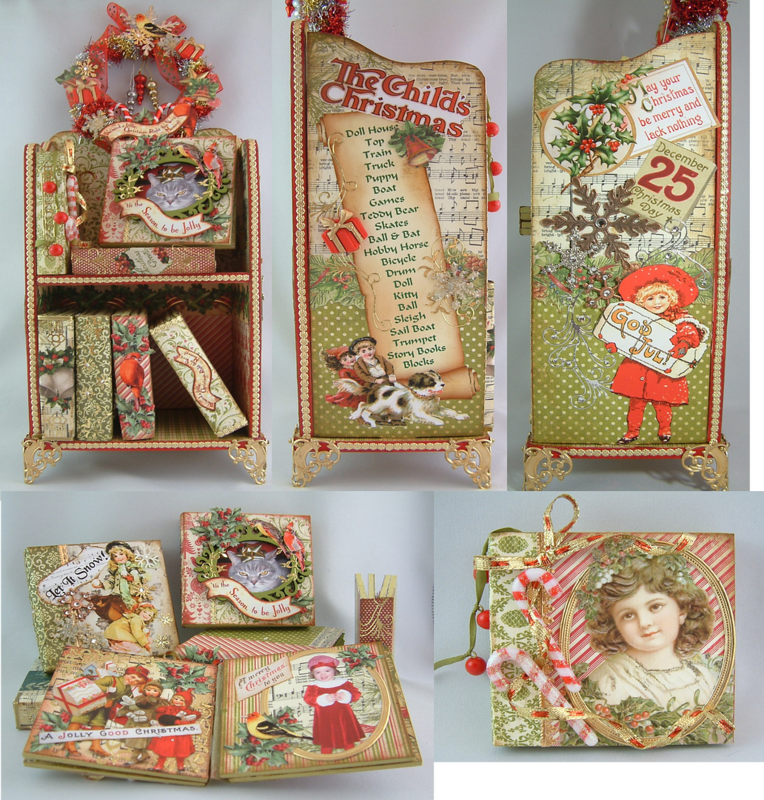 What a wonderful post, I love Christmas in July and this project will definitely be one I'll have to try :-) I'm new to your blog and look forward to seeing more! 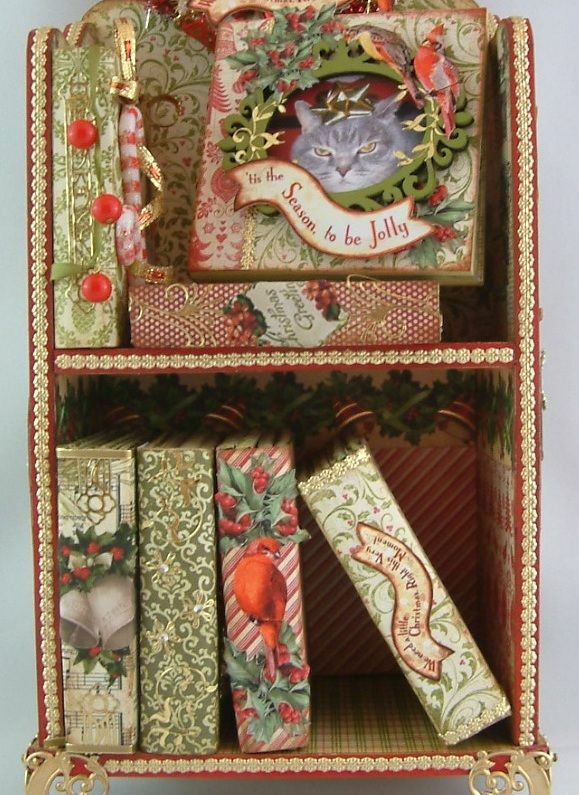 How absolutely quaint and adorable! 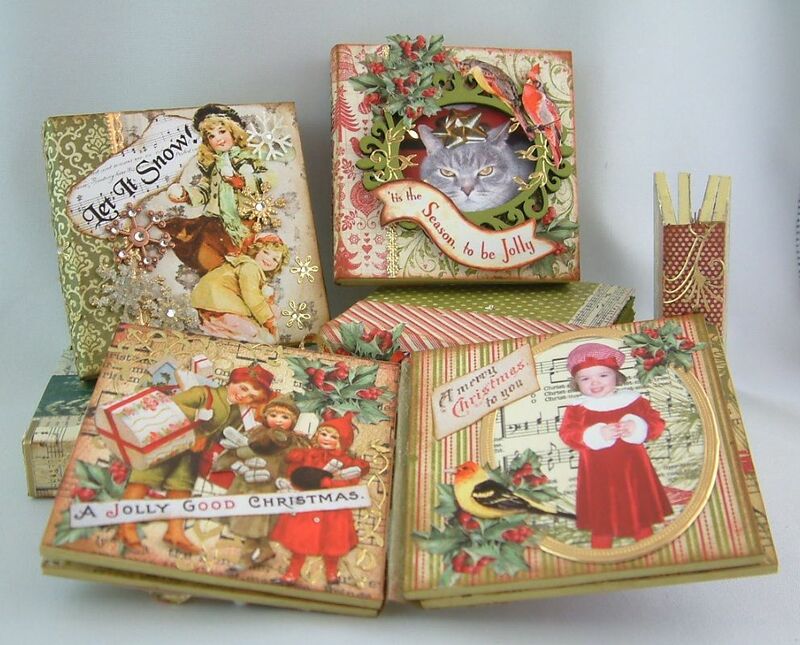 Love the little books sprinkled with good cheer of olde time ephemera! Great work...and yes, would make a wonderful gift! Thanks for the inspiration and reminding us of the 'joy of Christmas'! Ditto to what everyone has already said! Laura, this is just darling, and your tutorial is so complete and easy to follow. Thanks for another great project and fabulous inspiration!